In previous articles we’ve mentioned how a producer, for many reasons, would release under several aliases. Terrence Parker stated in an interview that it was a business technique used to “fool” people into thinking your label had more credibity, i.e. more “artists” releasing under one label is more impressive than a label boss releasing his own tracks. Thanks to the abundance of information floating around these days, many pieces to several influential producers proverbial puzzle, are falling into place. Kerri Chandler, Terrence Parker, Ron Trent, DJ Pierre are all perfect examples of this, for now however, we’re focusing on the father, Marshall Jefferson’s ‘Virgo’ moniker. Virgo, being a nod to Jefferson’s star sign & personal traits of being a perfectionist, was his first alias. He jokes, “I used to use the alias ‘Virgo’ (1985/86), but changed it to Marshall Jefferson when I became sober in 1986 and stopped getting smashed all the while!”. However it was not by choice that Virgo was dropped as a moniker. Jefferson’s breakthrough track ‘Move Your Body’ was rushed to be released & ‘Marshall Jefferson’ was penned, not ‘Virgo’ as the tracks producer. The tracks success meant that ‘Virgo’ was bumped out of the spotlight. Virgo’s first release in 1985 was an eight track LP called ‘Go Wild Rythm Trax’. It was produced by Vince Lawrence who pushed Jefferson to the brink of quitting. The significance of Virgo’s 1986 release ‘Free Yourself’ is that it’s arguably one of the first four* acid tracks made for club play. Earlier we explained the history behind Phuture’s ‘Acid Tracks’ & it’s importance in history; this EP can be lumped into such importance. As for the ‘Free Yourself’ EP, it was released on Trax Records; not to be confused with Virgo Four (Eric Lewis & Merwyn Sanders) who also released on Trax. 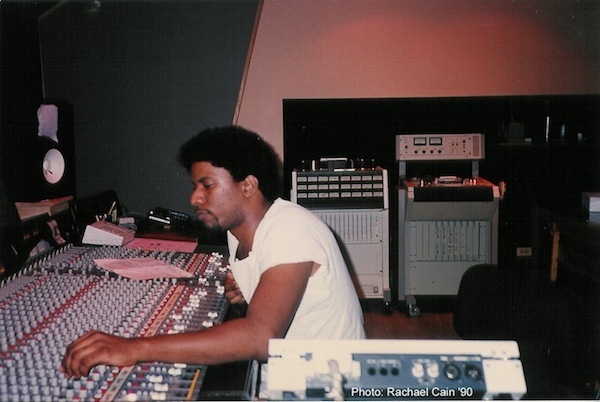 Adonis who also co-produced the EP with Jefferson, pulled two of his tracks at the last minute, one of those being ‘No Way Back’. Jefferson managed to record ‘R U Hot Enough’ & ‘My Space’ on cassette tape for the B Side. *For those interested in the other first club acid tracks: Adonis ‘No Way Back’ / ‘We Rockin Down the House’ (1986) Sleezy D ‘I’ve Lost Control’ (’86) & ‘Acid Tracks’.